This continues the observation of a forced merger of two groups of cats, each of which had a stable organization before the merger. Like Watership Down, this post is only marginally about animal behavior. You are free to draw whatever parallels you would like. The Thompson Family Cats used to have the run of the house and had a well-established pecking order. They were, and still are, friendly and outgoing toward strange humans, whom they view as potential allies and sources of food. They were active during the day and tended to sleep at night, aligning their activities with their primary clients, Amy and Doug Thompson. I use the term clients advisedly because these cats seem to regard the Thompsons with the same regard that consultants treat clients. They listen politely but ignore everything said. They put on a daily show and tell to keep their clients amused and to insure that the clients keep the food coming. I did not get any indication that these cats considered themselves owned or otherwise beholden to the Thompsons. The Thompsons and ourselves are considered part of the entertainment. The St Lawrence Family Cats are wary of strangers and are happy to stay in the room they share with us because they find themselves in a strange house with many hostile cats. They are very aware that their survival depends on our protection so they show more interest in us than they ever did before. Our two cats sleep most of the day and are very active at night. This means that they can explore the house at night when the Thompson cats are sleeping. These nightly forays usually end with a headlong dash back to the safety of our room when the Thompson cats wake up and investigate who is wandering around and jumping on couches. Our cats now recognize that our bedroom belongs to them and are now willing to defend the place against the Thompson cats. This is in stark contrast to the earliest days when they didn’t know that they had a place of their own. Their behavior has changed. In the beginning our cats would flee whenever a Thompson cat would appear. Now they sit in the doorway when the Thompson cats approach, but they flee when the Thompson cats get too close. They cannot stand their ground long enough to interact. This would indicate that the current pecking order puts all four Thompson cats above the two St Lawrence cats. Since I see no reason to artificially alter the pecking order, I am giving our cats every opportunity to fraternize with Doug Thompson’s cats in the hopes that the group will achieve a stable equilibrium as soon as possible. 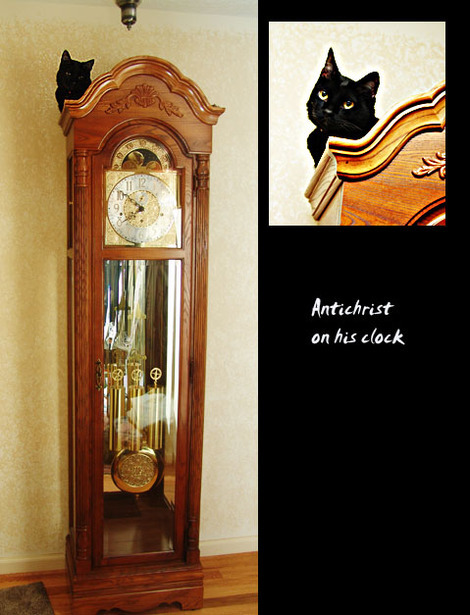 Antichrist is the cat at the top of the power structure. He has been so confident of his supremacy that it only takes one look from him to make any of the other cats immediately back down. He is "The King" and can be found in the highest places in the house. Antichrist’s only worry is that Dr Jekyll, the #2 cat, is far more aggressive than he is when it comes to meeting and mingling with the new cats that we brought in. This has shaken Antichrist’s confidence and has caused him to actively seek assurance from the Thompsons and from us whenever possible. Jekyll is currently the most aggressive cat in the house. He seems to have adopted the Avis motto as his own: "I’m #2 so I try harder!" He promotes himself both to our cats and to us. It is very hard to take a decent picture of him as he is usually in the middle of all the action and will hog the picture when he sees the camera. Jekyll plays the role of "Challenger". Buffy is the only female in the group. Even though they are all neutered, she seems to exert an enormous influence upon Antichrist and Jekyll. She is very aloof and seems to be biding her time. She attracts the most interest of any cat in the group. She is playing the role of "Cleopatra" . Her position in the group is based on her strong personality, not her strength. Just curious – where is Chewy in all this reorganization? Chewy relocated to a farm in Botetourt County where she runs free with one of her brothers and two children who love dogs. She was our gift to a family that wanted two puppies from the same litter.